With the facade fixed up, the yard needed attention too. A towering cluster of gnarled pines in front shaded a large swath of roof, creating an ideal breeding ground for moss?and rot. "And when you've got a tight grouping of trees like that, they prevent other plants from growing," says TOH landscape contractor Roger Cook, who removed the trees. In their place, the Kievals chose a variety of ornamental shrubs, including hydrangeas and a privacy hedge of inkberry (Ilex glabra); Kousa dogwood trees will fill the yard with beautiful white blossoms in spring. The finishing touch is a new bluestone walkway, with pavers set in a classic running-bond pattern, that connects the porch to the street. Visitors no longer have to walk up the driveway. As for the Kievals, they couldn't be more pleased. "We moved to Lexington because it's such a tight-knit community, the kind of place where you can have a spontaneous gathering of friends and neighbors," says Jody. "We finally feel like our house is inviting enough that people will want to stop by!" 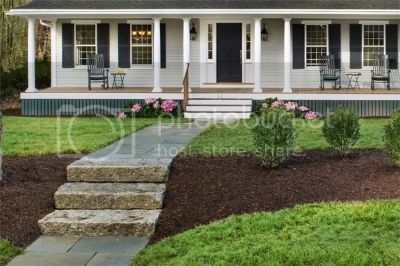 Shown: The inviting new porch sets the tone for the renovation, while a new bluestone walk leads the way from the sidewalk. 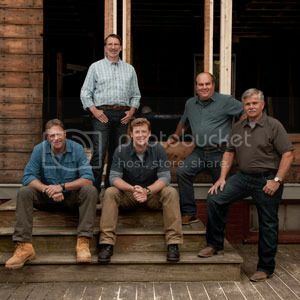 Host Kevin O'Connor arrives to find the second floor sanded, stained and sealed, and finds General Contractor Tom Silva overseeing the crew as they start on the first floor, turning the bleached out red oak floors to a dark walnut color. In the kitchen, the cabinets are mostly installed, and carpenter Chuck Parker shows Master Carpenter Norm Abram The custom refrigerator panels and how he's properly mounting them to the refrigerator. In Lexington Center, just steps from the Battle Green, Kevin meets local designer Robin Gannon to see how she used her modern and eclectic style to decorate 22 rooms of a historic inn. In the temporary garage workshop, Norm shows Kevin how he?s turning a chest of drawers into a sink base for the new powder room. General Contractor Tom Silva and Host Kevin O'Connor build a basic entry shelf from poplar and plywood. Electrician Scott Caron helps a homeowner wire a basement room for outlets and lighting. 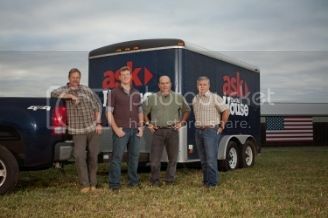 Then, Kevin, along with Landscape Contractor Roger Cook, Plumbing and Heating Expert Richard Trethewey, and Tom ask "What Is It?" Richard walks Kevin through the "dos and don'ts" of hooking up an icemaker to a refrigerator. Richard shows several kits for hooking up an ice maker. Many come with a "saddle valve," which Richard says is prone to failure and leaks. He instead recommends installing a "T" to the existing water pipe and a dedicated shutoff for the ice maker. He also shows options for piping?plastics, braided hoses, and copper. Richard prefers to use copper. All of the options shown in this segment are available at home centers or plumbing supply shops. In the barn, Tom and Kevin build a basic entry shelf from poplar and plywood. Tom built the shelf out of 1x4 and 1x8 poplar plus ?" plywood. He used trim head screws and wood glue to secure everything, then finally attached coat hooks. All items used for this project can be found in a home center. Tom shows a blue and white tool, that spins, and the guys try to guess its intended use. The Spin Chill is used to accelerate cooling down drinks, and can be found online at spinchill.com. Roger shows some solutions for fighting drainage issues in backyards. Roger demonstrated EZflow, an all-in-one French drain pipe, for moving water away from a foundation. He also showed a Pro Series Channel Drain for moving water away from a low area and a Flo-Well Dry Well for collecting and slowly dispersing water. All products shown are manufactured by NDS and available at home centers. 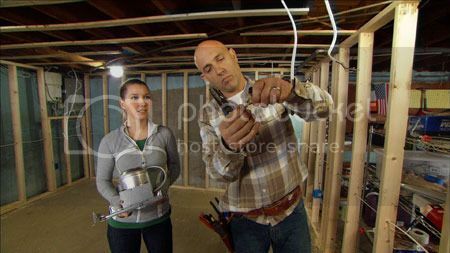 Electrician Scott Caron helps a homeowner wire a basement room for outlets and lighting. All material including used for this project including outlet boxes, non-metallic wire, staples, AFCI (Arc Fault Circuit Interrupter) breaker, recessed fixture housing and switch can be found at the local home center or the local electrical supply center.